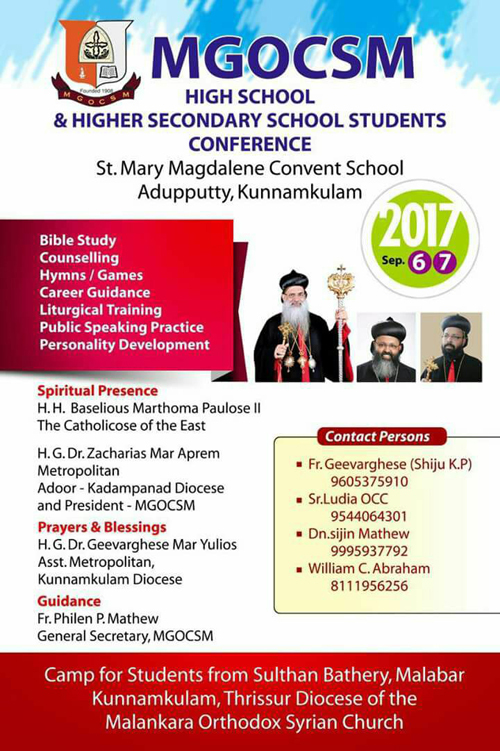 High School and Higher Secondary School Regional Conference - St. Marys Magdaline Convent School, Aduppootty, Kunnumkulam (September 6,7). The High School and Higher Secondary School Regional Conference of MGOCSM were conducted on 5th and 6th of September 2017 at St Mary Magadalene Convent School , Adupputty. 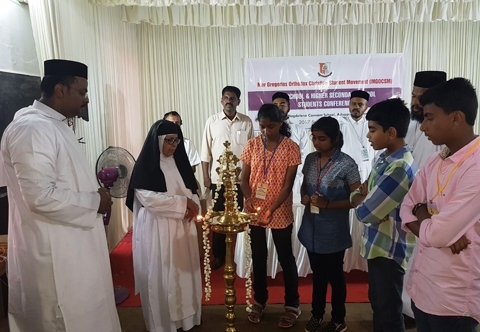 The conference was organised for the student representatives from Diocese of Malabar, Sultan Bethery, Kunnumkulam and Thrissur. about Ninety delegates attended the conference. The conference was inaugurated by Mother Barbara OCC, Superior, Mary. Magdalene Convent adupputty. The parley was nourished by Motivational and orientation talks, Bible Study , Singing sessions etc. Experienced facilitators from different arena lead the sessions in the conference. Rev. Fr. Philen P. Mathew, General Secretary of MGOCSM brought the attention of the array to the Annual Theme of MGOCSM " Set your mind and heart to see the face of our lord". Rev. Fr. Varghese Thomas Malabar, Rev Fr. K. P. Geevarghese , Rev. Sr. Ludia OCC,Br. Melvin, Mr. Preeth Chandanapally , Mr Praveen Varghese Thomas lead the different sessions in the Congress and ameliorate the delegates to think differently. Singing session proceeded by Mr Ashin Shajan made the conference more alluring. The conference wind up by the Valedictory function which was inaugurated by Rev Fr Geevarghese Tholathu, Diocese Secretary, Kunnamkulam.